"My beard makes me distinguished looking." Active, adorable and ultra-smart, the wirehaired dachshund has personality to spare. He’s the only type of dachshund that produces a thick undercoat, which requires stripping a couple of times a year. Unless you’re grooming your wooly wiener dog for the show ring, a relaxed do is your best bet. Grooming a wirehaired dachshund for show is a detailed and lengthy process, best done by a knowledgeable groomer. Stripping takes place about a month before a show to remove dead hairs and give the coat a little time to fill in. A week before the show, the groomer shapes the eyebrows and trims away errant hairs. If your dog has thick fur, some thinning is in order at this time to create a well-shaped beard and to remove long hairs from the hocks. The idea is to accentuate the breed standard and minimize differences. You can bathe your dog the day before the show or at the show. Most dog shows provide grooming areas with bathing stations so you can fuss over Manfred until the moment you lead him into the ring. It sounds like torture, but stripping or plucking your wirehaired dachshund’s undercoat isn’t painful. A professional groomer uses a special stripping comb to grasp the dead hairs and pull them off. You can do the same thing at home by gently grasping small sections of hair and pulling lightly. The dead undercoat hairs will come right out, and the new hairs should slip through your fingertips. If you do it right, Winnie might sleep through it all. 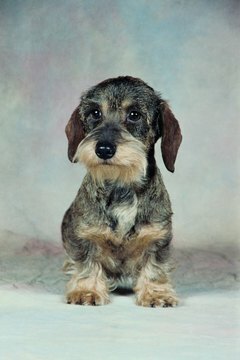 Clipping your wirehaired dachshund involves shearing his coarse coat to within 1/8 inch of his skin. A professional groomer should do this. Clipping removes some of the undercoat, and you can remove the rest by gently rubbing Otto with a rubber mitt while he’s lounging. A clipped coat provides a good option during hot weather, especially if Otto spends a lot of time outdoors, but it's not recommended for show dogs. Wirehaired dachshunds tend to get all types of seeds and weeds tangled in their coarse fur, but you can remove most of them by gentle brushing with a rounded-tip bristle brush. Unless your dog is dirty, bathing him more than once a month can dry out his skin and lead to irritation. When you do bathe, apply a conditioning shampoo meant for dogs and followed by a leave-in conditioner to keep his coat manageable. Your dog needs his nails trimmed or ground down every two to eight weeks, depending on how much he walks on hard surfaces; if they click on the tile as he walks; it’s time for a pedicure. Wipe his eyes and ears as necessary to remove dirt or discharge.